Powerful, moving, illuminating; just some of the words used to describe the artwork from last year’s exhibition produced by children with acquired brain injury. We commissioned this artwork as part of our work with The Child Brain Injury Trust during Action for Brain Injury Week 2014. The Child Brain Injury Trust does incredibly important work supporting children with acquired brain injury and their families. I am delighted to say that our child brain injury team at Bolt Burdon Kemp has once again teamed up with The Child Brain Injury Trust, and we are hosting an exhibition on the 22 July 2015 at our offices in London. I think this is such an important opportunity for brain injured children to express some of the difficulties they experience in such a powerful, moving and unique way. Before talking about this year’s exhibition, it is worth revisiting the fantastic artwork from last year which was exhibited at The Saatchi Gallery in London. Who wouldn’t be moved by the image of books being locked away to convey the message of 16 year old Oliver, who felt unable to access books as a result of his brain injury? In contrast to this, the amusing piece by 9 year old Ewan having a party in a library to show the difficulty he has controlling his emotions in a public place. The piece by Melissa aged 12, particularly resonates with me at the moment as I have a client aged 15 who is really struggling to relate to her peer group as a consequence of her brain injury. Melissa’s picture has helped me to gain some insight into what it might be like for my client and all of the children whose brain injury impacts on their ability to relate to others. The artwork was originally displayed at the very beautiful art deco Town Hall Hotel in East London, before moving onto the Saatchi Gallery. I attended the opening at the Town Hall Hotel where I was fortunate enough to meet one of the artists; 7 year old Ben who produced the painting of his head exploding like a volcano when he gets angry. The painting provides a stark image of Ben’s frustration and anger when he struggles with things like trying to tie his shoe laces or doing his maths homework. This year the theme for the artwork is celebrating ‘Unsung Heroes’- the parents, siblings, carers, teachers who are doing what they can to make life a little bit easier for children with acquired brain injury. I am delighted to say that the artwork produced by the children was as impressive as last year and I am really looking forward to exhibiting the art on the 22 July (details below). 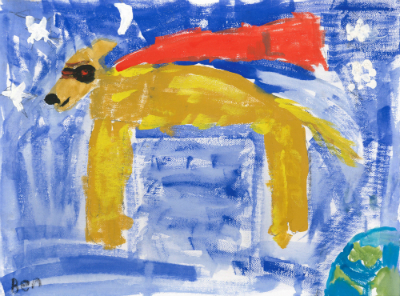 Nine year old Ben decided to paint Lana the dog as his unsung hero. Ben refers to her as his “super dog”. The Child Brain Injury Trust arranged for Ben to work with Lana from Dogs for the Disabled in 2013. This was a pilot project, one of the aims of which was to help Ben gain danger and road safety awareness. Prior to Lana’s involvement, Ben would rush along the pavement and cross the road without looking. During the project Ben would walk with Lana and helped to ‘train Lana’ in road safety. The results were so successful, that Ben even started teaching his younger sister about road safety. Working with Lana also helped to improve Ben’s attention and concentration as he would read to Lana and groom her which also reduced his anxiety and increased his confidence. Nearly 18 months on and he is still talking about Lana. Clearly Lana was an important part of Ben’s rehabilitation. Ben’s story highlights some of the important work that The Child Brain Injury Trust does supporting children with acquired brain injury and their families. Ten year old Ewan suffers from difficulties with his memory and concentration as well as problems with balance and coordination as a result of acquired brain injury. 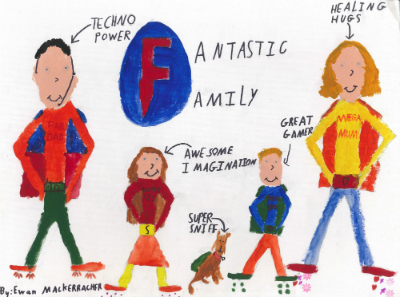 He chose to draw his whole family as his super heroes. His Dad has “techno powers’ because he helps Ewan with his tablet or computer. His mum has “healing hugs” and makes him feel better. His sister has an “awesome imagination” and makes up stories with him. His brother is a “great gamer” as he likes playing on the X-box with Ewan. Even Scampie the dog gets a mention because he is always sniffing around him which obviously provides some comfort to Ewan. I can only imagine how happy Ewan’s mum must have been when he said that she had healing hugs! 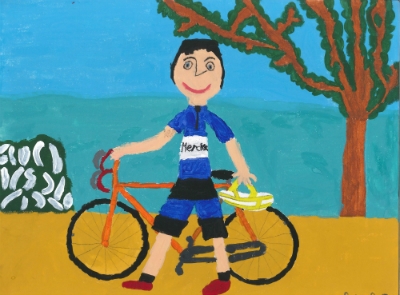 Finally 11 year old Rosa has painted her Dad as her unsung hero because he takes her cycling and football training and helps her put her leg in a splint every day. 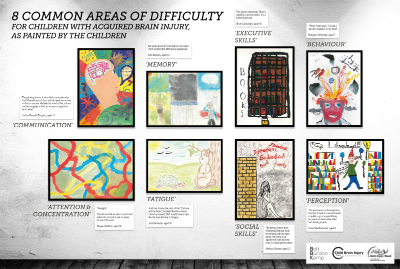 The child brain injury team at Bolt Burdon Kemp will be hosting the art exhibition for The Child Brain Injury Trust on the 22 July 2015 at Providence House, Providence Place, Islington, N1 0NT between 6.30pm and 8.30pm. There will be a reception of drinks and canapés. If you would like to come along to see this fabulous artwork, please email Rachel Parsons. The art exhibition was a big success! All ten pieces of art were sold which raised over £3,000 for The Child Brain Injury Trust. The event was attended by around 65 people, including two of the young artists; David Taylor, who painted his dog ‘Buster’ as his super hero, and Bronwen Morgan-Jones who painted herself. Bronwen’s painting represents the strength that she has shown in challenging perceptions of people with brain injury, and her determination to lead a full and exciting life. I am a Partner at Bolt Burdon Kemp solicitors specialising in Child Brain Injury claims. If you would like advice about making a claim on behalf of a brain injured child, please contact me free of charge and in confidence on 020 7288 4854 or at cherylabrahams@boltburdonkemp.co.uk for specialist legal advice. Alternatively, you can complete this form and one of the solicitors in the Child Brain Injury team will contact you. You can find out more about the team.